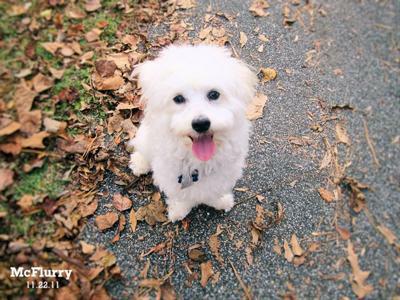 My Maltese Poodle mix is mostly white with some patches of Apricot when his hair grows out around his ears and a little swirl on his back. Never knew a cute puppy would bring so much responsibility. I have learned so much! However, I don't regret getting my bundle of joy! He is super sweet!!!! 50% a snuggle & cuddle cutie! Loves laying on his back like a human and hiding under the covers and stealing my super soft pillow! Better yet, he loves taking up the entire bed laying perpendicular! Surprised I have not fallen off the bed yet! He does not sleep forever though. 730 am he is ready to get his day started with or without me! Super protective & jealous. His mommy is all his - - - forever and always! pffft! Talk to my boyfriend about it! haha! Shy at first around people, may even bark, but once he gets use to you, you better run because he wants to play all day everyday! 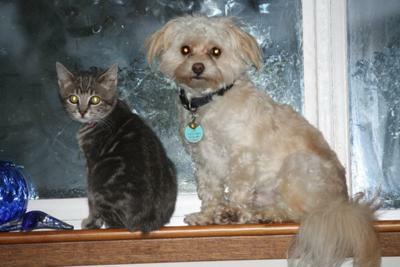 My Maltipoo loves other dogs, and will bark and bark until you play with him. Def. an attention seeker too! If not attention, he will pester until he gets things his way. He is a handful I tell you! We are constantly working every day on his social skills, something he lacks I admit , but he is getting better around people. When I first got him, it was just, me, him and David all the time. He knew of no one else. Heck, now he lets people at the dog park pet him, keeping a close watch on me though. You could never steal him because he would never let you get a hold of him like that. CAUTION: He knows how to put his little teeth to work. *sigh* ask my vet about that one. I think she came on as too aggressive for him. You have to go slow with him, or maybe it's just teething. Spoiled... most of the time ♥ But he knows what "kennel" means (: Sits when told. Will STAY and knows when I am leaving and coming. Can do 10+ tricks! Just learned to ring the bell before he goes outside to potty. 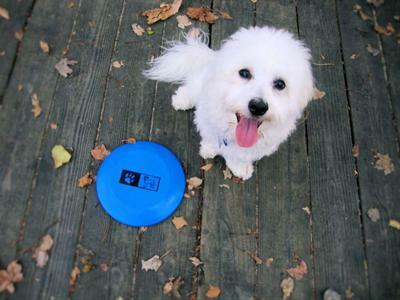 My Maltese Poodle has too many toys and just got into frisbee. His theory, the bigger the better! He may love to run and chase balls and frisbees, however, does not enjoy bringing them back. Instead rather you chase him lol. We are working on the fetch game. I am constantly trying to keep his mind working by teaching him new tricks, things, and every day stuff. He is a challenge but something I have put time, dedication, money, and lots of love into. Thanks for the update on your maltipoo. 6 month old Lily is just like your little guy. I wish we could get them together. Lily is boundless energy-it seems like the more we walk and play the more she wants to walk and play. It's interesting to know that so many of McFlurry's personality traits are part of the breed. Lily is very snuggly and sleeps over our heads on as many pillows she can get. She is so bright and wants new to learn new things every day. She is also very mouthy and likes to chew on everything including us! She is shy when first meeting new people and sometimes has a shrill bark. Best of luck as you continue to mold your little sweetie into a charming addition to your home. 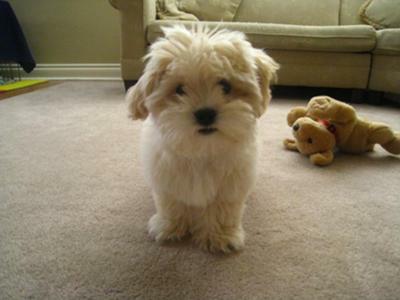 I am so in love with my male Maltipoo Gio. He is an incredible, smart, funny, and above all loving dog. He attacks me with kisses every chance he gets. We call him my "shadow" because he follows me everywhere I go. He always wants to know where everyone is going and what everyone is doing. He loves to be around people. 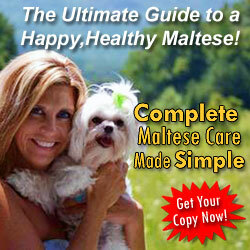 My Maltese Poodle is very polite and sweet with strangers and children. It's almost like he just knows when it is appropriate to act like a crazy puppy or a proper puppy with great manners. He loves to cuddle and be as close to be as he can get. Sometimes we joke he is my doggy scarf because he will crawgil under my chin and sleep on my neck. I couldn't have imagined a better puppy than my Gio and I fall more in love with him everyday! Well our family has had a Multipoo since 7 months ago. He is so smart and very friendly with everyone. He is apricot in colour and his birthday is on May 24th. He has a million dollar smile and will make you smile everyday. 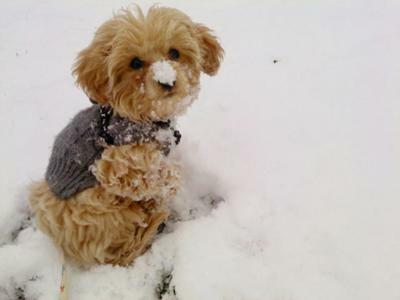 A Multipoo is definitely a puppy to have in a house full of kids. JUST TELL ME UR EMAILE... :) :) :) Ill send tons! This is the owner of the site. I sent you an email asking for a photo. Just email me back the pic. Thanks! HIS PIC - romeo ooh romeo - where for art thou Bailey Romeo! 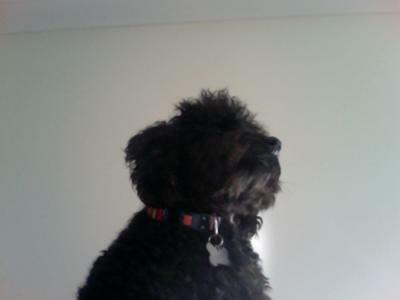 My name is Steinbeck the Moodle (Maltese Poodle mix) and like my namesake, I am a dog of the people. I love the smell of books, especially the ones written by a certain Salinas Valley author =) I enjoy normal doggy activities like fetch with a tennis ball or my red, piggy beanie baby; but I particularly love my dog park outings. I can never get enough of the eclectic smells of public grass or the fresh, furry coats of park visitors. Two mini-pincher sisters always smell like Johnson & Johnson baby shampoo. I like to run with them. The best parts of my day are breakfast, dinner, and anytime my pet parents hug me. My name is Steinbeck, your everyday Moodle. 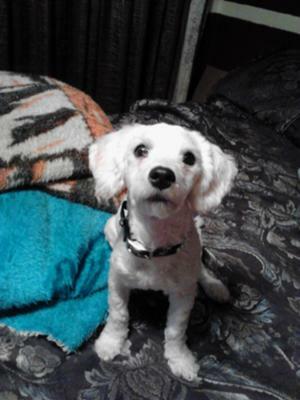 My Maltese Poodle Mix dog is white with black spots and long legs, his parents are part of a circus and they perform at all the shows. I took ownership of my dog, Dasher, when he was 7 weeks old, and he has never stopped impressing me with his intelligence and magnificent skills. He is very, very good with jumping and balancing, and he can jump on window sills and climb through windows. He can also balance on my back with ease and without a fear of height. 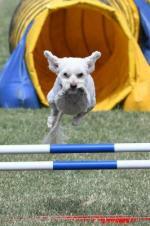 My Maltese Poodle is also extremely quick, as he can run 100 meters in about 9.5 seconds. He is very easy to train and he learns very quickly. He is also an extremely affectionate animal, and will jump on the bed and lie next to you for hours. My long-term goal is to maintain his bloodline as I think that this Poodle mix is unique. We have had our little guy for about 4 mo now. I am a volunteer at the Ariz. Humane Society in Phx. He had been hit by a car and was found wandering. The vet fixed him up and he estimated his age as 2; he then went to a foster home for 3-4 weeks. When he came in for adoption, where I work, it was love at first sight. 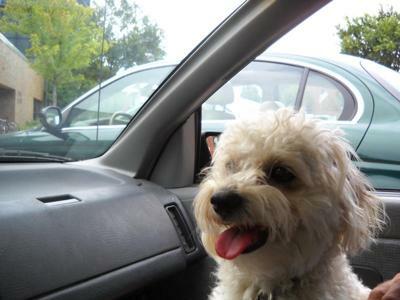 We were told by someone who seemed to know, he was a painted Miniature Poodle. After we found your website we thought we had it figured out; he looks like the little guy to the right. Except, he weighs 12 lbs. which seems to be a bit over average. His new name is Maxwell and he has changed our life, all for the good. His name given him when found was "lambchop" which is exactly what he looks like; I just couldn't picture myself saying "here lamchop". 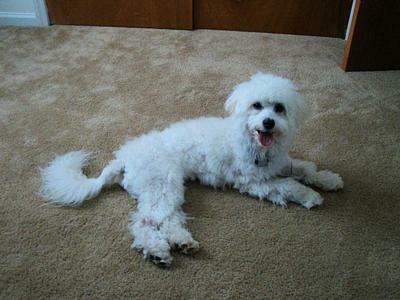 When we got him he was all white with curly-cue type hair from head to toe. Really cute, soft as a pillow like a lamb. He was so gnarled, however, we finally took him to a groomer, who gave him a poodle type cut head to tail. Tail, by the way, had been clipped, to about 3 inches and goes constantly. After the grooming, guess what? His whole back and most of the sides came back apricot color. When he gets excited like when we get ready to go for a walk, besides jumping up and down he curls himself in a "C" position because his little body is kind of long and he's able to do that. Of course, we now say, Max, give me a C.
He seems to be in very good health; is kind of fussy eater; does not really care about treats, little milkbones, etc. His little heart seems to beat very fast; almost too fast to count. Is that normal? Hope so. He goes absolutely nuts when he smells or thinks he sees a rabbit. His ancestry must include avid rabbit hunters. All walks are built around the next rabbit sighting in his mind. Never even comes close to catching one, of course. And, I seem to able to see them before he does; his site range is about 25 yards? But scent range is outstanding. My wife and I are retired and hope Maxwell will outlive us, we hope. Have thought about getting another just like him, for insurance, maybe a spayed female to keep him company when we are gone. Forgot to tell you, Maxwell is fearless; knows right away if he likes the other dog. If a big dog gets aggressive he will stand up on his back feet while on the leash, growl like he's saying, come on, puttem up, and show his teeth. Sorry I went on so long but Love to talk about Max, I guess. 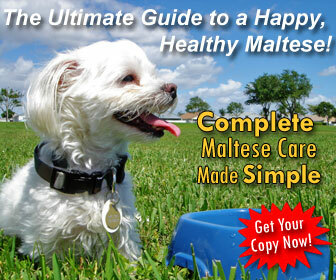 Do you think he really is a Miniature Poodle Maltese mix? Anything you can tell us would be appreciated. Thank you. I adopted Oreo 1 year ago and in January my family had a DNA test on him he is part Minature poodle and maltese....LOVE HIM BUT HE IS 16 LBS AND 13" tall. He is very protective. I think he is part mule and part pit bull. Elvis is a very cute 10 pound white with some light brown Multipoo with the personality of a Doberman but the cuddleness of a baby. Once at home, Elvis is in his territory, protecting us from the potential dangers that persist out our doors. Right around dusk and early in the morning, Elvis is on top of his game. Barking, growling, and sometimes willing to attack any size dog is his MO, but once he sniffs them, his tail starts wagging and his attack mode is over. He loves to get wet in a pond or ocean, but only up to his belly. Mud is another story. The muddier he gets , the more fun he is having. He loves to run free and run with the big dogs. He is very fast for his size and can cut and weave like a halfback. We do have some health issues. 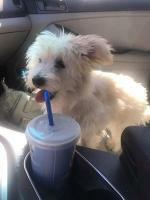 My Multipoo has had an ear infection at least twice a year, hot spots 4 to 5 times a year. I have tried to adjust his food to see if it is allegies, but that does not seem to help. So he likes to stratch, roll around outside on imaginary smells (at least to me) and can smell an entire area with the best of them. I love being able to pick him up when he won't come,he is easy to travel with and adapts well in almost any environment. Other people are able to babysit him with and without dogs. Other than being a dedicated watchdog, there are no negative features to owning my Multipoo Elvis. Now without kids, he is our non-stop pleasure. 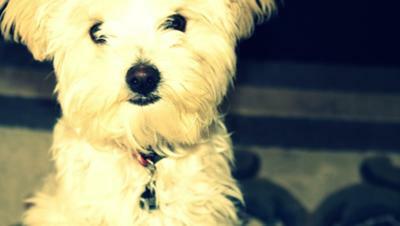 My Poodle Maltese is such a clever little guy. He's very very shy with new people but once he gets to know you you'll be his friend forever. He's very smart I am having a hard time pottie tranning him but I think its only cause he's still a puppy. He has wavy hair its not to curly like the Poodle but not straight like the Maltese I say he's perfect. Very very loving. I Hope U Find YOUR SWEET HART. Auggie the Multipoo is a little lover. He loves to cuddle and give kisses. He is the best dog ever! Every single person he comes in contact with loves he and looks forward to the next time they meet. He is easy to care for and has brought so many smiles to so many friends and family. If you're thinking of getting a puppy I would tell you get a Mutlipoo... they love children and love to play. 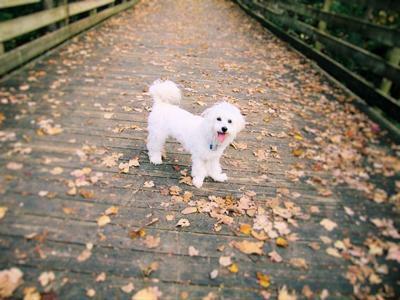 Toby is the cutest Moodle (Maltese Poodle) in the world. when we first got him he was jet black but as he has grown he has slightly faded into a chocolatey brown colour and I love it! He has boo on the face and runs around in circles all day when he isn't sun-baking. He is my best friend in the world and I hope he lives forever! 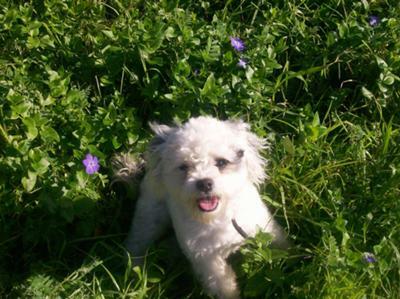 My male Maltipoo Snoopy is the best dog that I could ever ask for. His mixed breed makes a perfect companion. I take him with me almost ever where I go and he is always well mannered. He loves to go to the dog park where he can run and play with the other dogs. I even ride him on my motorcycle and he is very comfortable while riding and never nervous even when the roads are a little twisted. He is my little buddy and partner. My multipoo is great his name is Jamal and we love him so much my kids have a great time with him he loves to play with his toys and sleeping in my bed he is the best dog I could have ever ask for.